Until someone pointed out my affinity for those old Kotaku colours. There’s nothing wrong with the old colours! Apparently, I really miss the pink tones contrasted against the yellow of Kotaku’s older colour scheme, and had a moment. Or maybe it’s just that pink and yellow make a boss combination. 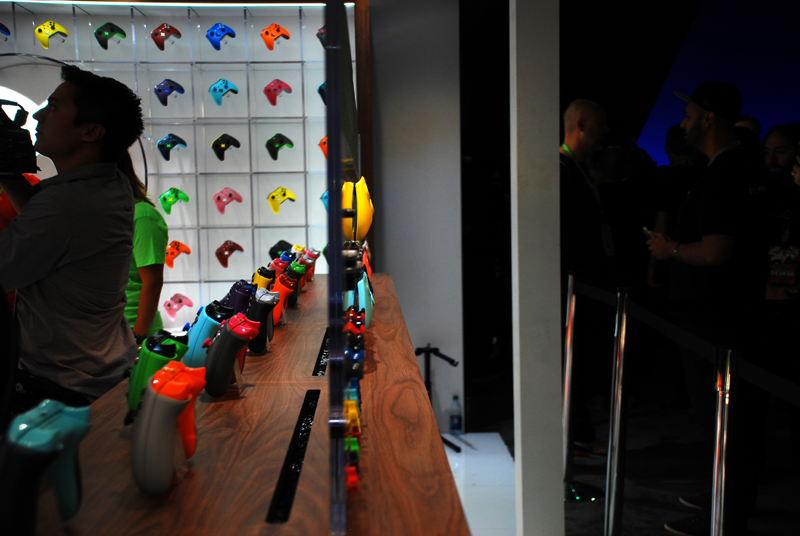 Either way, I was mostly happy with my eye for fly fashion massacring colour composition, when I designed an Xbox One controller last week at E3 as part of Microsoft’s XBox Design Lab booth on the show floor. In case you missed it, Microsoft introduced the ability to design your own Xbox One controllers through the aforementioned “Xbox Design Lab” website. The cost of the controllers start at $79.99, with optional engraving for an additional $9.99. As reported, the service will be for the newly redesigned pad, and the controllers are slated for shipping starting September 2016. The process was simple, and the snappy colour names were adorable. Deep pink on the front face? Yes, please. A splash of Lightning yellow at the handles and the back? Ooo, a stroke of genius (or maybe Stockholm syndrome..?). After a couple of minutes, I was done. I e-mailed my finished controller design to myself, and now you all get to see where I went horribly right wrong. I didn’t know what to do with the triggers, and went with a Photon blue which probably wasn’t the greatest choice, now that I’m staring at it. Whatever. Don’t you judge me. Harshly. Or at all. That’d also be awesome. I also have no regrets on the Regal purple thumb sticks. Nor should you. At the end of it all, I spent some time musing over which colour pin I should take for gracing Microsoft with a taste of designing prowess. That was the reward for waiting in line for about 10 minutes and customizing a controller for 15. So many life altering decisions were made that day. If you must know, I went with a pink Xbox controller pin. My mind was already in a place, and remained there. You too can design your controller on Xbox’s Design Lab site (for free, and you can save and share the design with friends). And you should! I’d love to see what you guys come up. Bragging rights to the person who comes up with the coolest. It’ll always be mine.